When it comes to yarn crafts, we always have been and always will be massive fans of literally any technique. We’ve been crocheting since we were young kids and we love knitting so much that, to this day, we have a huge yarn stash in our crafting room. 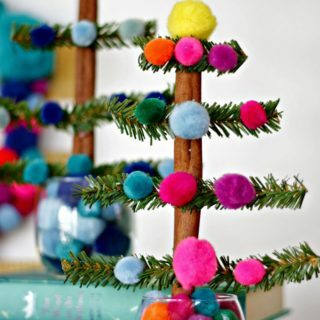 Because we’ve done those for so many years, we also learned how to make yarn pom poms by hand many years ago and we adored that process, so we make them all the time. 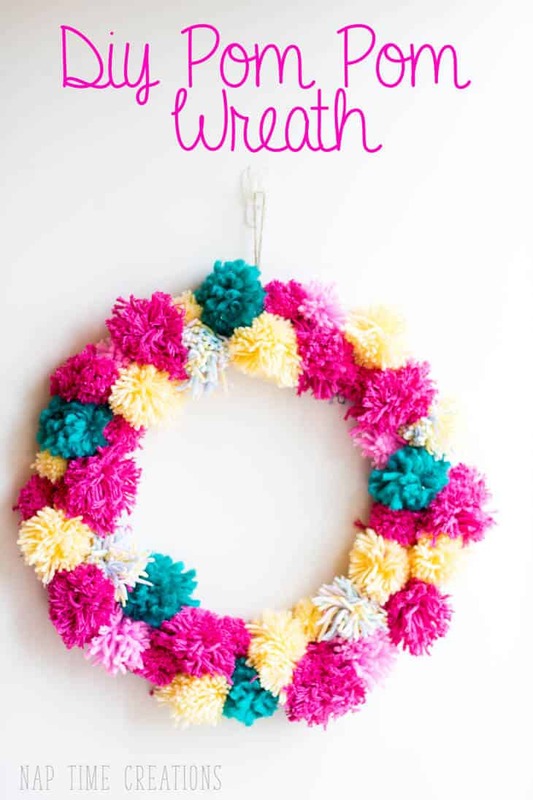 That’s why we’ve been looking up so many pom pom craft tutorials and inspiration pages recently! 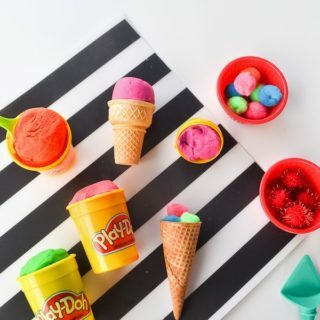 Just in case you’re as interested as we were, if not more, in the idea of making things from homemade yarn pom poms, check out these 15 awesome ideas that we uncovered in our search. 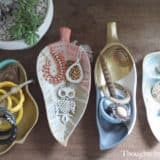 Are you the kind of crafty person who loves personalizing and embellishing things that you bought from the store, just to give them a little bit more character? Then we think you might get along quite well indeed with this adorable pom pom blanket idea featured on A Little Craft in Your Day! 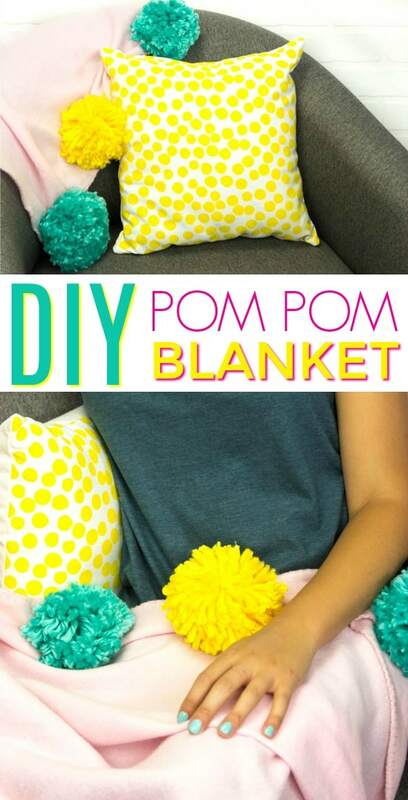 They show you how to stitch yarn pom poms all the way around the edge of a blanket you already own. 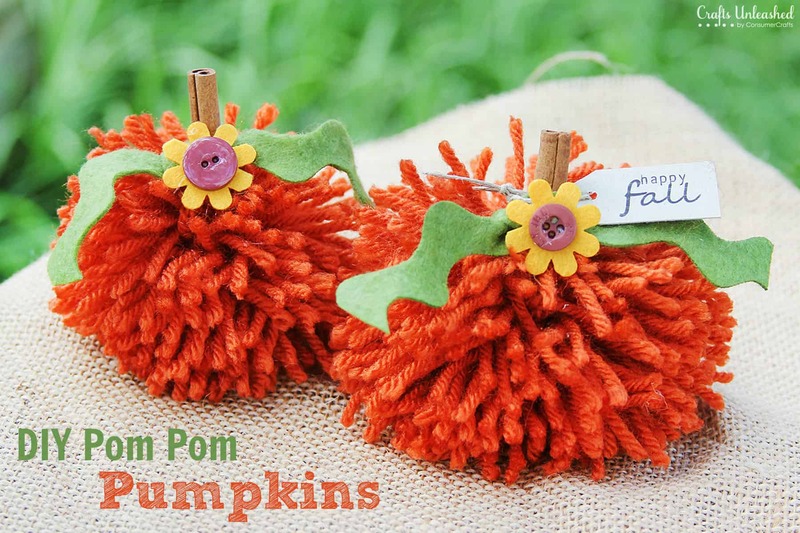 Are you actually looking for a craft that’s a little more kid friendly so you can get your children in on the fun of working with pom poms? 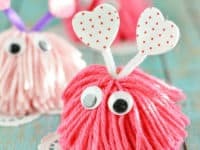 We love that idea because it gives you a fantastic opportunity to teach your kids how to make pom poms and how to dress them up like little characters! 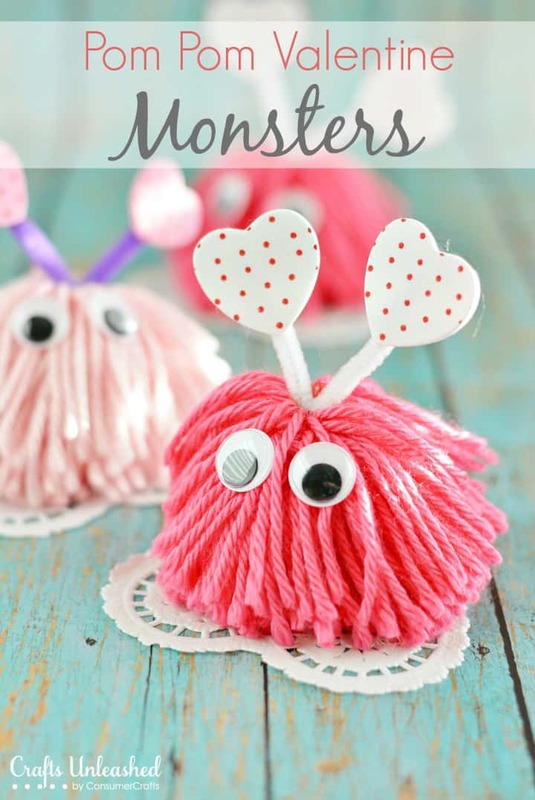 Crafts Unleashed shows you how to make these adorable heart monsters that make for the perfect Valentine’s Day craft. 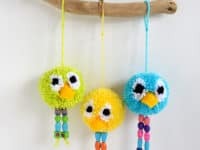 Do you love the idea of making little characters out of pom poms but your kids are a little bit older and you’re convinced they’re ready for a little bit more of a challenge than what we just showed you? 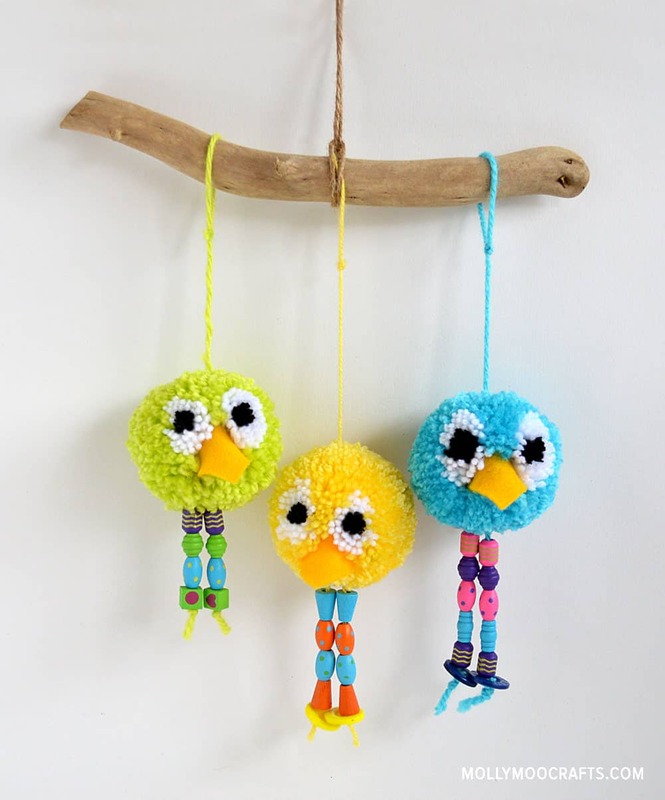 Then maybe it’s time to try multi-coloured pom pom making like you see in the features of these little birds, outlined on Molly Moo Crafts ! 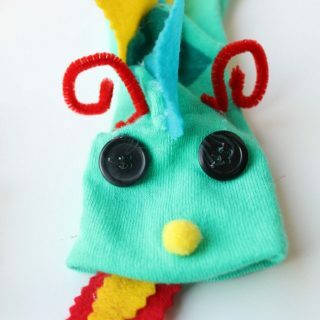 We love the way they added felt beaks and funny dangling legs made from wooden beads and and buttons. Are you the kind of crafter or DIY enthusiast who loves combining your creative skills with your love for cartoon, video game, and fan related things? 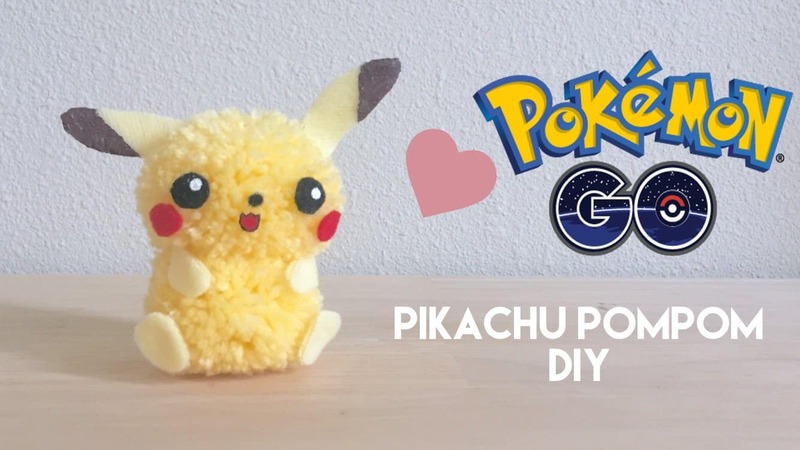 Well, if you’re a big Pokemon fan, we think this Pikachu pom pom idea outlined step by step on Flying Mio is the perfect idea for you! They show you how to attach two pom poms together and embellish them with little felt details for the face, paws, and ears. 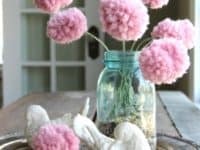 Have you been scrolling through our list so far and thinking about how, while many of these ideas where you embellish the pom poms and combine them with other crafting techniques are cute, you’d really rather prefer to just keep making pom poms because you find them so fun to create? Then we have a feeling you’re going to adore the way Life Sew Savory made an entire door wreath out of differently coloured yarn pom poms. 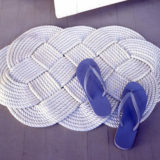 This is a great way to use up yarn ends from your stash, no matter the thickness! 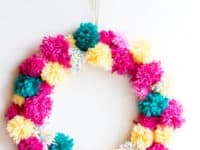 Are you rather keen indeed on the idea of making something that involves lots of pom poms but the door wreath idea just doesn’t quite appeal to you enough to convince you? 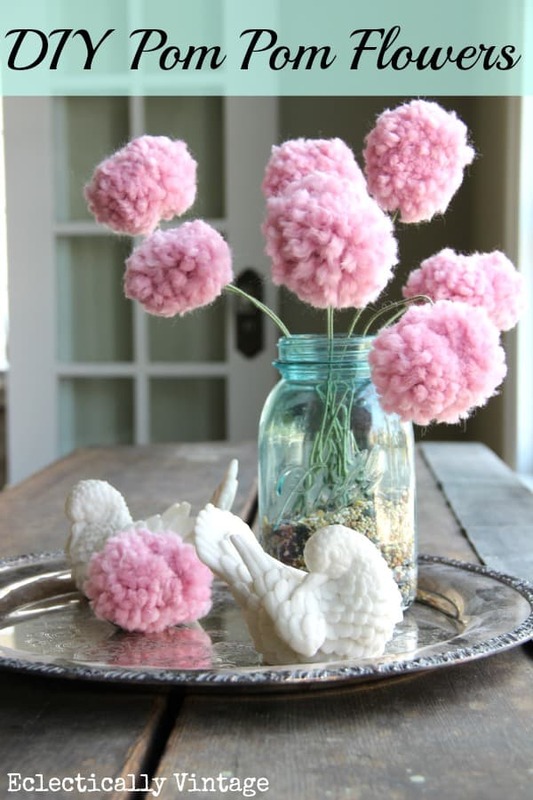 In that case, we’d suggest taking a look at how Hometalk made these adorable pom pom flowers and perched them in a vase! They’ll add a cheerful, summery look to your home without wilting like real blossoms might. 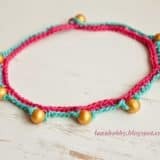 When we started talking about “pom pom crafts”, were you actually hoping to find tutorials for things made with crafting pom poms rather than homemade yarn pom poms because you’ve never been good at making them, even though you’re a big yarn crafter? 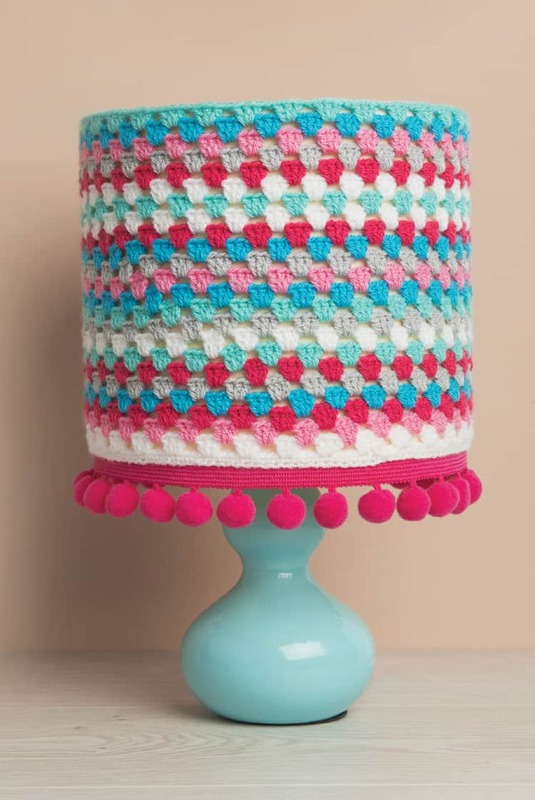 Then we think perhaps you’d prefer something like this wonderfully crocheted lampshade cover that is simply embellished with pom pom trim instead! See how it’s done and get the full pattern on Sew and So. 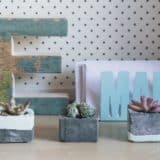 Perhaps you’re actually just looking for a few simple crafty ideas to make your desk space and study process a little brighter and more appealing, and you’ll also take any chance you can to use up yarn ends from your knitting and crochet stash? Then here’s a super easy idea from Guidecentral that’s just plain fun! 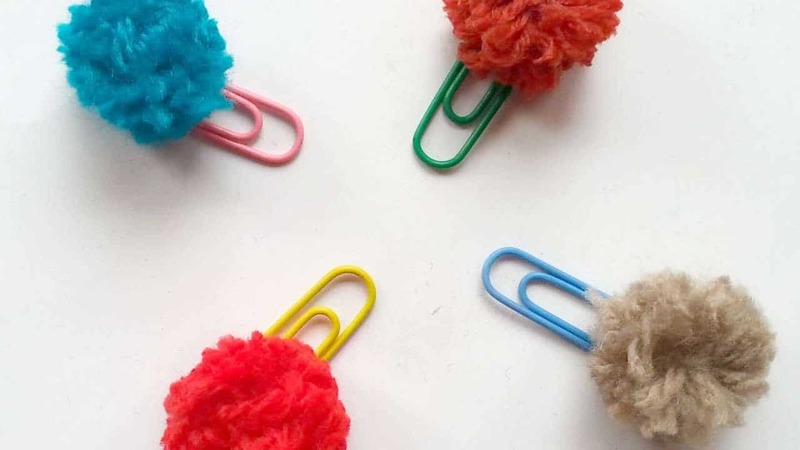 They suggest gluing little yarn pom poms to the ends of some paperclips to make neat page markers and bookmarks. Did we catch your attention when we started talking about pom pom edged blankets but you’re a big fan of comfy sets and you’d love a pillow to match? 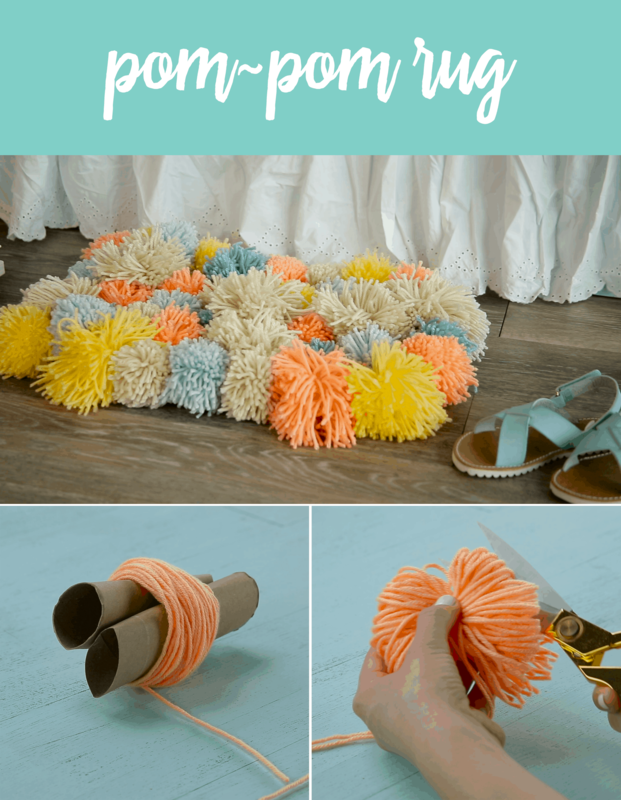 Then you sound like the perfect person to start working on an awesome project like this super fluffy pom pom pillow outlined step by step on A Kailo Chic Life! Besides how soft the finished product is, we adore the way this project lets you use up yarn of all different colours, effects, weights, and fibres all in one place. Talk about making a statement piece! 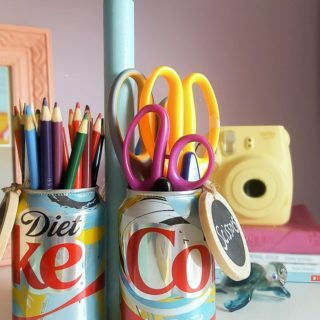 Were you actually a huge fan of the paperclip idea because it’s precisely the kind of quick, simple crafty thing you’re looking for on a dreary afternoon but you just can’t see yourself using that specific idea once you’re done? Then here’s a fun alternative for your consideration! 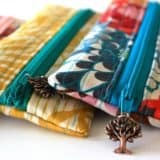 Check out how Made in A Day made a few bright pom poms and attached them to key chains to make awesome rings that will help you lose your keys far less. 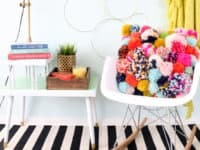 Are you actually scrolling through the list so far still thinking about bigger projects like the pom pom pillow and wondering if you can make an even more thorough pom pom accessorized room? 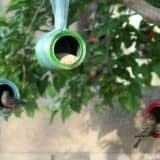 Perhaps you just like the techniques you saw there and think you’d like to tack and even bigger idea because you’ve got the time and you think you’d finish the pillow too quickly? 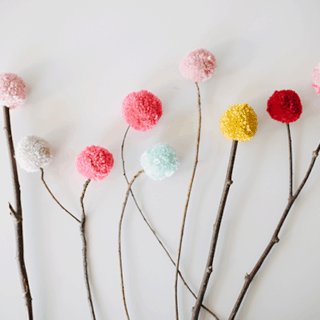 Then we’d absolutely suggest taking a look at how Babble made an entire pom pom floor mat! 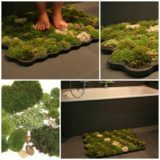 We promise the awesome way it feels on your bare feet when you’re done, while also brightening up your room, is worth the patience and effort! 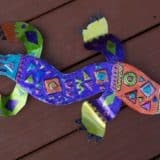 Are you the kind of crafter who adores making new things for each season and holiday that passes? We’re like that too, but we’re also obsessively prepared, so we’re always collecting ideas and tutorials for the future, even if we’re nowhere near that holiday. 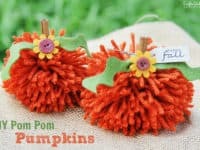 That’s why we felt some excitement about these adorable yarn pom pom, button, and cinnamon stick pumpkins even though it’s only July. Get the full details for making it happen on Crafts Unleashed! 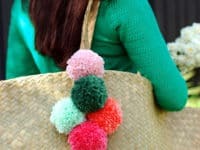 Just in case you really were interested in finding new pom pom crafts that featured different materials than just yarn (but you weren’t very enticed by the pom pom trim lampshade cover)? 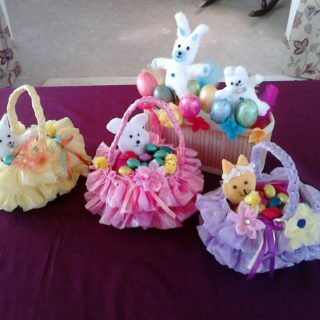 Then maybe you’d prefer to make a pom pom craft from tissue paper instead! 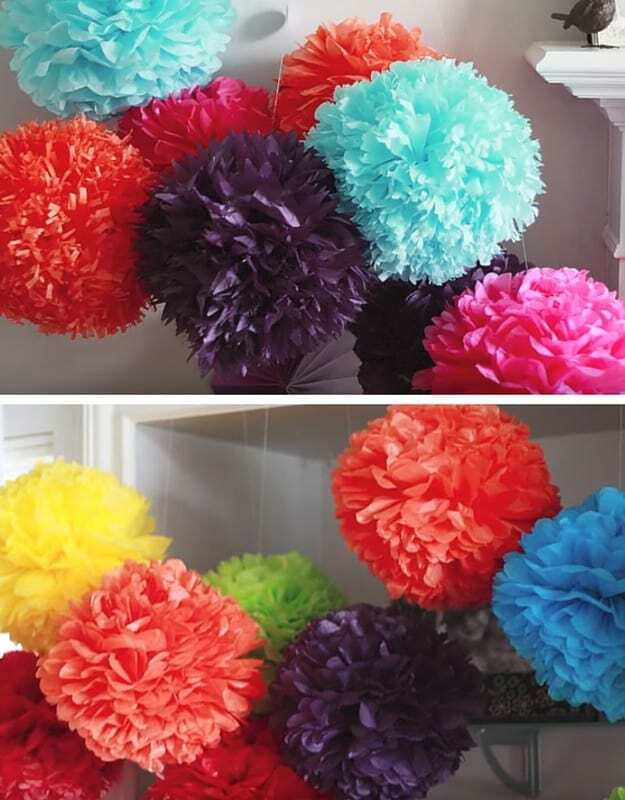 We love the way DIY Projects made massive decorative pom poms from differently coloured tissue paper to hang all over on special occasions. 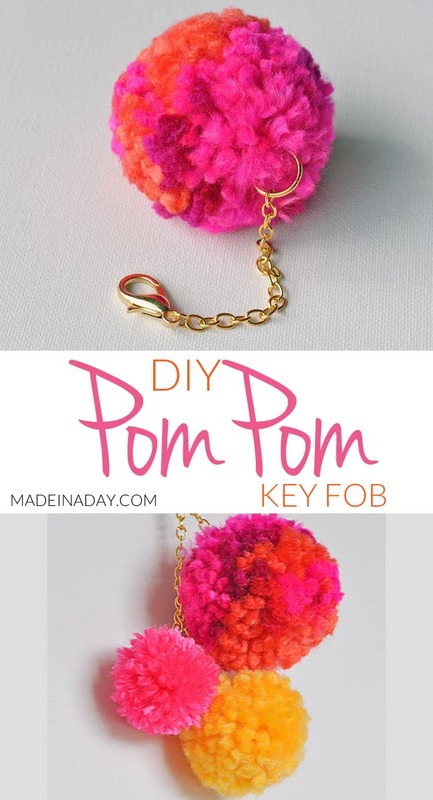 Were you a pretty big fan of the multi-layered pom pom idea we showed you earlier when we were talking about the cute pom pom keychains we outlined earlier but you’re just not sure that such a big keychain is something you’ll really use? In that case, we’d suggest taking a look at how We Are Scout made this tote tassel instead! 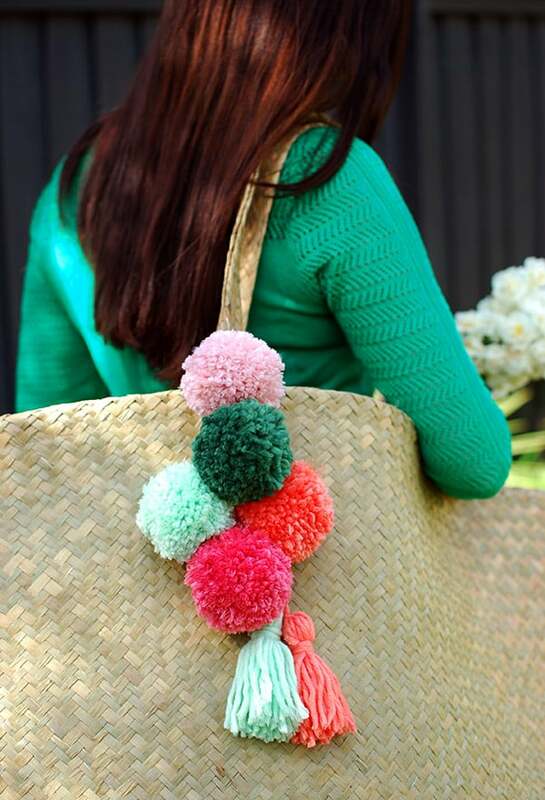 They show you how to make the pom poms, string them together, and affix the whole thing to your tote bag of choice. Are you actually still thinking about how cute the little pom pom characters we’ve shown you so far are, so you’d like to collect as many different ideas and tutorials as possible, just to make sure you’ve got a lot of things you’ll really like making packed away for a cold day in? Then here’s another one for your records! 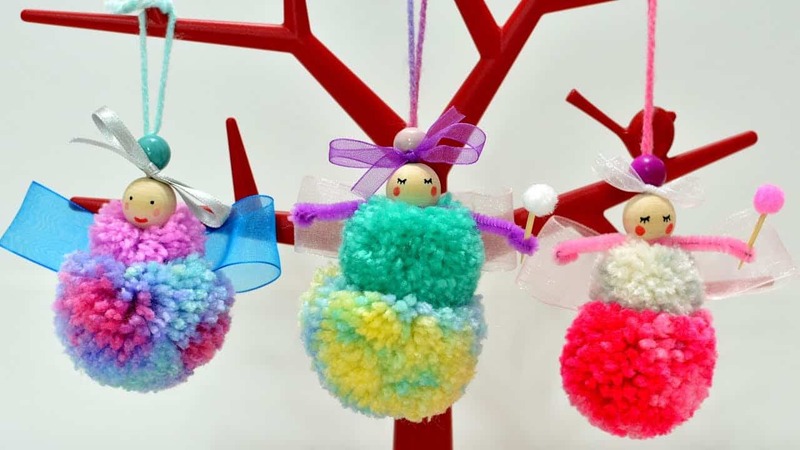 Check out how Art & Joy created super colourful, extra fancy looking little fairies out of two handmade yarn pom poms, wooden beads, and pipe cleaners.